A universal ban on hits to the heads is not happening in the NHL. At least, not now. What the GM meeting did produce was a novel idea: A recommendation that the league enforce the rules! As NHL.com's Shawn P. Roarke put it: " they opted to recommend that existing rules governing boarding and charging be more stringently applied. They also believe the threat of stiffer supplementary discipline for those that deliver illegal hits to the head, as well as for repeat offenders in the League's supplemental discipline process, will have the necessary chilling effect to make the NHL workplace a far safer one." For the time being, it's really all that the league can do. A universal ban would only create more gray area. "We are going to see if we can get something more precise than a blanket head hit rule..."
The key words from all of the commissioner's interviews were "precision" and "definitive." The single greatest criticism that the league has endured through all of this concussion crisis is it's seeming failure to interpret similar incidents with consistency. 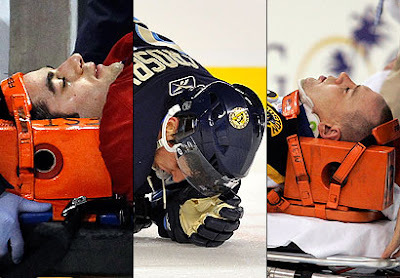 The last thing the NHL needs is more controversy over head shots. As we have seen thus far, a blanket ban invites all sorts of discretionary calls and interpretations. Where was the offending players elbow/arm/glove at the point of impact? What was the intention? Did the receiving player move suddenly or change direction just before impact? etc... debate can go on and on. Without doubt, reckless hits are a danger to player safety. However, clean hits can be too; but they are part of the game that the GM's, players, owners and fans alike would like to see preserved. "To give a reference point, you all remember Phil Kessel's first game as a Leafs. Mattias Ohlund stepped up and drilled him. Got him right in the head with his shoulder. We want that hit in the game. Phil has to be more alert and keep his head up. He didn't get a concussion on that play, but even if he did, I'd have the same view. We want that hit in our game." It's a great point made by Burke citing his own player as an example. Eric Lindros had to quit the game because of concussions. Most of them were caused by clean hits courtesy of Scott Stevens and Darius Kasparaitis. Lindros just couldn't remember to keep his head up. A blanket ban on head hits would not have made a difference to one of that era's best players. As Bettman outlined, stricter enforcement of existing rules and harsher discipline for repeat offenders can go a long way to protecting players. The question is will they execute the plan, and do it with consistency?